Roses are the flowers of love, of romance, and of poetry. The Bachelor only hands them out to his favorite special ladies. In Beauty and the Beast, the magical flower wasn’t a daisy or a hydrangea—it was a beautiful red rose. On Valentine’s Day, what’s the most popular flower bought to show our sweethearts just how much they matter to us? Roses. There is something about roses—and rose essential oil—that transforms the bland into the extraordinary. With essential oils, rose oil is one of the most aromatic, most potent, and most effective. It has a distinctive fragrance that is immediately recognizable—like romance distilled in a bottle—and is popular in perfumes and aromatherapy. However, rose essential oil also has several surprising health benefits and uses beyond just a pleasant fragrance. The essential oil of roses is the product distilled from the Damascus Rose (Rosa damascene) plant. The Damascus Rose is the preferred variety for creating rose oil because it is the most fragrant species. It is also believed to be the original red rose, with the strongest aroma and the highest oil content. It takes tens of thousands of blooms to distill only one ounce of rose essential oil, making it one of the most expensive oils on the market. However, since it is so highly concentrated, you only need a few drops of this precious oil to reap its benefits—you get quite the bang for your buck when you use rose oil. The essential oil of roses is packed with vitamins, minerals, and antioxidants that are great for many reasons. This essential oil is also a popular ingredient in beauty and skin care products and aromatherapy, but it’s good for so much more. Rose essential oil boosts self-esteem and confidence, which helps in fighting off depression. Studies have shown that rose and lavender oils can help treat anxiety and depression in postpartum mothers as well as having the same effect as prescription antidepressants without the harmful side effects. If you suffer from anxiety, you may find a bit of essential oil from roses is helpful in keeping the blues away. Rose oil is also useful for its anti-inflammatory properties, and can treat redness and irritation. Conditions such as psoriasis, eczema, rosacea, and atopic dermatitis can benefit from a skin refining treatment with rose essential oil. It can also be beneficial in cases of inflammation caused by microbial infection, indigestion, and dehydration. Rose oil may calm a patient’s high fever by easing the inflammation within the body. If you suffer from acne, you may benefit from the astringent properties of rose essential oil. It help tone and lift the skin, strengthening tissues while protecting against natural signs of aging, like fine lines and wrinkles. Rose oil’s natural astringent properties can also help stop wounds and cuts from bleeding by contracting the blood vessels. This property is also useful in strengthening hair roots and follicles, leading to reduced hair loss and healthier, more resilient hair. Rose oil can make for the most fragrant way to treat your wounds. It can help heal cuts effectively through its antibacterial and anti-viral properties, providing a shield that protects the body against invaders. This element also helps to support the immune system, giving it a boost in fighting off infections. Roses have a long-standing reputation in the romance department – there’s a reason the Bachelor hands out roses instead of dandelions, right? 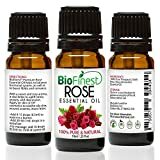 The distinct aroma of rose essential oil can also give a boost to your libido, reduce symptoms of sexual or erectile dysfunction, and help stimulate your love life overall. If you suffer from irregular menstrual periods and other hormonal issues, rose essential oil can help with that. It increases the level of menstruation-inducing hormones in the blood, helping to regulate and encourage a normal menstrual flow. It also may help with other related issues like bloating, mood swings, and fatigue. It may also help relieve the severity of menstrual cramps. Studies have also shown that the essential oil of roses may benefit women who are experiencing menopausal symptoms. Some even claim regular use of rose essential oil may delay menopause. Rose oil regulates hormone production and helps to balance the female hormones, purifying the uterus and keeping it functioning properly. Not only is rose oil helpful with menstrual cramps, but it can also help to ease tense muscles and spasms. Using the oil in a massage can help ease tension and relieve pain and muscle spasms in various limbs. Your liver works hard to keep your body clean and free of toxins by constantly breaking down complex foreign substances and filtering toxins from the blood. All this work can take a toll on the liver, leaving it weaker and fibrous. Rose essential oil can help detoxify your liver so it can perform more efficiently. The minerals and antioxidants in rose essential oil are stars in the arena of skin care. Rose oil helps to fade scars, stretch marks, and acne, and pox blemishes and quickly even out skin tone. It has excellent emollient properties to moisturize dry skin. The same antibacterial and astringent properties that help other conditions are also beneficial in balancing the skin. Antioxidants in rose oil also neutralize harmful free radicals and leave skin feeling soft and supple. Other benefits of rose essential oil include healthy circulation, reduced blood pressure, and relief from asthma and dehydration. It has been shown to help relieve stress and lower the body’s concentration of the stress hormone cortisol. It can increase feelings of calm and relaxation and help people achieve better quality sleep. In small concentrations, the essential oil of roses can help relieve headaches and migraines. With its singular scent, the essential oil of roses is a popular choice for aromatherapy. A few drops in a diffuser or vaporizer can bring the health benefits of rose oil to a whole room. You can also sprinkle a drop or two onto a cloth or tissue and then inhale the oil to get relief any time of day. When combined with a mild carrier oil (such as jojoba, sweet almond, or avocado) rose essential oil is safe to apply directly to the skin. If you have sensitive skin, test it on a small area first. In this form, you can use it as a massage oil mixture or a natural moisturizer. You can also add the essential oil of roses to bathe water a few drops at a time—since the oil is so highly concentrated, you’ll want to be careful not to put more than a few drops so as not to irritate sensitive skin. In skin care products, rose oil is a popular ingredient in soaps and creams due to its high levels of antioxidants, moisturizing properties, and pleasing aroma. If you enjoy making your own skin care products, there are many recipes available online to create your very own rose oil soaps—and you can determine whether you want to blend oils (like rose and lavender) or bask solely in roses. You can also use rosewater (also known as rose distillate or rose hydrosol) in your skincare kit. While not pure rose essential oil, it is derived from a similar process. Small batches of rose buds are steamed until they release their therapeutic compounds into the water. The pure rose oil is drawn off and the remaining rosewater (which contains tiny amounts of essential oil) is collected. Rosewater is often used in facial mists, toners, and hair tonics, delivering many of the same great benefits of pure rose essential oil—but in a more diluted formula. If you’d like to use rose essential oil in combination with other oils, you have in your collection. It blends well with geranium, jasmine, clove, and Palma Rosa essential oils. It has also been successfully used with lavender oil in certain studies related to depression and anxiety. Never ingest 100% pure rose oil, and do not apply essential oils to the eyes or mucosal membranes, as it can cause irritation in these areas. If you suffer from a chronic condition, such as depression, always consult your health care provider. Pregnant and nursing women should also consult their health care providers before using essential oils. While essential oils have many great properties and can provide many benefits, they enhance—but do not replace—standard medical care. Roses aren’t just pretty flowers, they’re powerhouses full of amazing properties we can harness to help improve our health and well-being. Whether you use it as an aromatherapy element, or in your skin care routine as a moisturizer, it has amazing properties that can help you look and feel your best, inside and out. Rose essential oil is one of the most potent tools you can have in your essential oil arsenal! If you’d like to try this potent oil, you can find it in your local health food or natural foods store, and it is also available from many online retailers.